We all want to have that “great” oboe sound, but sometimes it is something that seems to elude us. One of the biggest problems is define exactly what that great sound is. Many words are used to describe the sound of the oboe. I remember when I was younger listening to a very famous oboist pick up a student’s oboe and reed, play on it, and sound exactly the same as always. The sound seemed to come from somewhere other than just the reed. This happened several times in the section rehearsal. When I pick up my colleagues reed and oboe, I still sound like me and she sounds like her on my setup. Most oboists develop a sound concept at an early stage of playing, mostly conforming to what they are accustomed to heating at the time. It isn’t until later that one begins to understand what is happening. The process of “finding your sound” can take a long time, but it isn’t that difficult. If you’re a bit confused over what you want to sound like, just take it step-by-step. Listen to some recordings of some great oboists. Try and get that oboe sound in your ear, and imitate it. We live in a very good online world. YouTube is probably the best audio resource. Go through it and you will find some great examples. Tons of long tones. This is the best exercise that you can do. Always relax and let the reed vibrate. Think about bringing out the lower overtones in your sound instead of cutting out the higher ones. Always support the air column well. One thing you can try is to stand up against a wall with your back, shoulders, and head touching it completely. Play through your longtone exercises this way. It will feel really strange at first, but will get your air column opened up. Don’t get frustrated! A good oboe sound, just like a good wine needs time to mature and develop. Sign Up For A Reedbook Sneek Peek! 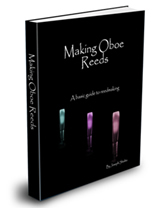 Get a peek at the first chapter of the Making Oboe Reeds Reedbook FREE and receive updates to the site directly in your inbox.